The seismicity associated with faults in the LZPR is currently located using some form of Geiger's method (Udias, 1999), that is a linearization of the travel time equation in a first order Taylor series that relates the difference between the observed and theoretical travel times to unknown adjustments in the hypocentral coordinates through the partial derivatives of travel time with respect to unknowns. There are some techniques available to improve the quake locations with the goal of identifying structural details, such as the location of active planes, into well defined focus. But in general, all methods show a diffuse picture of seismicity (figure 4). 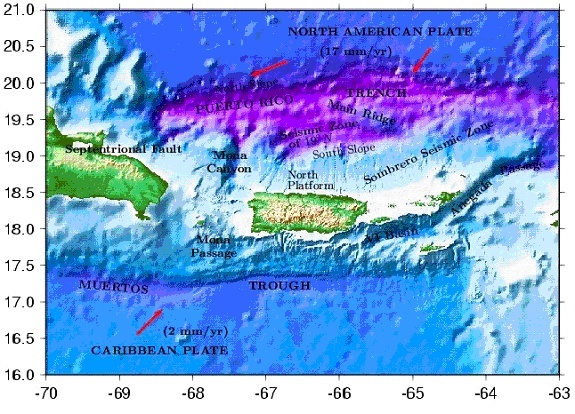 A very important observation is that the spatial distribution of smaller earthquakes delineates areas in which larger earthquakes are likely to occur (Kafka and Levin, 2000), but this requires a very reliable earthquake location method to delineate fault systems. Based in the hypothesis that any earthquake that occurs is due to the fracture in a specific fault, and that multiple and successive earthquakes delineate the fault plane, Huerfano (2003) proposed a complete set of faultings using two methods. The first is based on the composite focal mechanism analysis while the second is based on geometrical analysis of hypocenters stratified by magnitude.